In this guide, you will learn all about Bitcoin (BTC) and cryptocurrency, how they work, why they exist and what kind of technology is behind Bitcoin. It wasn’t too long ago when people started hearing the words Bitcoin and cryptocurrencies. Few people outside of the crypto-communities knew what they were and many thought it was just another fad that was bound to fail in a few years or so. The value of one bitcoin was just a few cents then so obviously it wasn’t worth a lot. For this reason, it was ignored by the masses. There were far more profitable investments one could make, after all. Those who invested sums of money on the new digital currency either believed in the system proposed by its founder, Satoshi Nakamoto, or they simply wanted to see how it works. Either way, those who believed were rewarded greatly, and continue to be rewarded, as a single bitcoin now costs thousands of dollars. It only took Bitcoin five years to breach the $1,000 mark in late 2013, and just a few years later, Bitcoin prices are at an all-time high – way past the $10,000 mark for a single bitcoin! With skyrocketing prices and extremely fast growth, more and more people are curious about bitcoins and cryptocurrencies as a whole. Cryptocurrencies are digital currencies which are electronic in nature. They do not have a physical form like paper money or coins which you probably have in your wallet right now. You can't hold them physically, but you can buy things with them. Depending on the merchant you're doing business with, they may accept more than one cryptocurrency as payment. According to CoinMarketCap, there are more than 1,000 active cryptocurrencies right now. If you’re looking to invest your hard-earned cash but can’t afford Bitcoin prices right now, there are plenty of alternative cryptocurrencies to choose from such as Ethereum, Litecoin, Ripple, Dash, Monero, Zcash, and more. We would, of course, advise you to do some in-depth research on the cryptocurrency you want to invest in as not all cryptocurrencies are equal. Some are more stable than others and would, therefore, make for better investments. Bitcoin is not the world’s first cryptocurrency, but it is the most successful. Many have come before it but all have failed. And the reason for failure? Virtual currency had an inherent problem – it was easy to double spend. You could pay $100 to one merchant and use the same amount of money to pay a second merchant! Scammers and fraudsters simply loved this loophole. Fortunately, in 2007, Satoshi Nakamoto started working on the Bitcoin concept. On October 31st the following year, he released his white paper entitled “Bitcoin: A Peer-to-Peer Electronic Cash System” which outlined a payment system that addressed the double spending problem of digital currencies. It was a brilliant concept that drew the attention of the cryptographic community. The Bitcoin Project software was registered in SourceForge just a little over a week after the white paper was published. In January 2009, the first ever Bitcoin block called the ‘Genesis block’ was mined. Days later, block 170 recorded the first ever bitcoin transaction between Hal Finney and Satoshi Nakamoto. The very next year, in November 2010, Bitcoin’s market cap exceeded $1,000,000! This was a very pivotal moment in the development of Bitcoin as this lead to more people getting interested and investing in bitcoins. The price at this point was $0.50/BTC. However, in June 2011, Bitcoin experienced the so-called “Great Bubble of 2011” after reaching an all-time high of $31.91/BTC. Just 4 days after reaching its highest price, the exchange rate plummeted to just $10/BTC. Many investors panicked at losing so much money and sold at a loss. It took almost 2 years for the exchange rate to recover and surpass the previous all-time high. Those who kept their bitcoins made the right decision as the price has continued to climb and surpass everyone’s expectations. What’s really interesting about Bitcoin is that while all transactions are public and nothing is hidden from anyone, no one actually knows anything about Satoshi Nakamoto. Many have speculated that he is not just one person but rather a collective pseudonym for a group of cryptographic developers. Some have come forward claiming to be Satoshi, but to date, his real identity remains a secret. 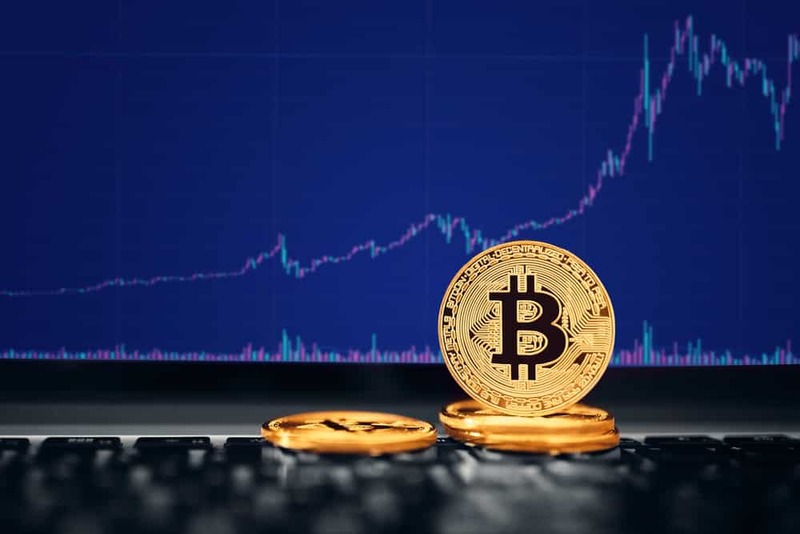 Many people have started thinking that cryptocurrencies, Bitcoin in particular, are on the brink of replacing our national currencies such as the US Dollar, British Pound Sterling, Euro, Canadian Dollars, and more. This is because cryptocurrencies have started to become very viable alternatives to traditional currency. Cryptocurrencies exist to address weaknesses in traditional currencies which are, of course, backed by central banks and governments. This makes traditional currencies prone to corruption and manipulation, among a host of other issues. Unlike traditional currencies, there is no governing body that backs Bitcoin and other cryptocurrencies which means they aren’t subjected to anybody’s whims. Bitcoin is completely decentralized, open source and transparent. This means that you can see all the transactions that have ever been done on the network and you can check and review the blockchain data yourself to verify the authenticity of each transaction. Bitcoin runs on highly complex mathematical algorithms to regulate the creation of new bitcoins and to make sure no double spending ever occurs on the network (remember, this is the Achilles’ heel of failed virtual currencies before Bitcoin). The Bitcoin code is so secure and advanced that it’s virtually impossible to cheat the system so if you’re thinking you can create an unlimited number of bitcoins, you’re greatly mistaken. One of the main problems of traditional currency is that these aren’t limited in number. This means that governments and central banks can print more money when they see fit. When more money is printed and enters the economy, this reduces the purchasing power of our paper money which means we need to spend more for an item we’ve only spent a few dollars on before; this is called inflation. Bitcoin, on the other hand, is a different story. The Bitcoin Protocol states that only 21,000,000 bitcoins can ever be mined and created which means that bitcoin is, in fact, a scarce resource. Also, like national currencies, bitcoins are divisible, much like cents to a dollar. The smallest bitcoin unit is called a Satoshi, and it is 1/100,000,000 of a bitcoin. This means you can invest a few thousand Satoshis at a time until you finally get a whole bitcoin. Of course, if you go this route, it may take you some time to get to 1 BTC but if the price continues to skyrocket, then buying a few Satoshis regularly may pay off in the long term. Another reason why cryptocurrencies are gaining in popularity is that it is highly portable which means you can bring it with you anywhere you go. You can do the same with physical money and gold. However, a large amount will lead to a heavy load on your wallet or bag. Try putting a million dollars in a briefcase or carrying a bag of gold! It’s certainly not as light as it looks in movies. With cryptocurrency, you have different wallet choices, all of which are highly portable, so you can easily make payments whenever and wherever you want. Bitcoins are not subject to bank and government regulations. This means you don’t need to pay those hefty bank fees which you incur whenever you send payments to other people. You also don’t need to wait several hours or maybe even a few days for your payments to clear or post as bitcoin payments are made almost instantly (usually in 10-45 minutes). In this section, we will do our best to explain the Bitcoin process as simply as possible without going into too much technical jargon. The first thing you need to do is get yourself some bitcoins. You can either mine this yourself, receive some as payment for goods or services, or buy at a Bitcoin exchange like Coinbase or Kraken. There are different wallets for you to store your new bitcoins in. You can use a desktop wallet, mobile app wallet, paper wallet, hardware wallet or an online wallet. There are pros and cons to each type of wallet. However, most experts agree that online wallets, specifically those on exchange sites, are not so secure because both your private and public keys are saved online. This makes your wallet highly vulnerable to hackers. When you’ve selected the most suitable wallet for your needs, you can then start making bitcoin transactions. To send bitcoin to another user, all you have to do is just get their email or bitcoin address, enter the amount you wish to send, write a quick note to tell them what the payment is for (this is optional), and hit the Send button! Alternatively, if you’ve got the QR code to their bitcoin wallet, you can simply scan it and hit Send. The transaction will appear in the other person’s account in a short period of time, usually between 10-45 minutes. The reason for this ‘wait’ is explained more fully in the next section. And that’s it! Bitcoin transactions are quick, safe, cheap and the perfect alternative to paying with bank-issued credit and debit cards, and even paying in cash. On the surface, Bitcoin transactions appear to be fast and easy – and they truly are. However, behind the scenes, the technology that makes the Bitcoin network run seamlessly is a massive ledger known as the blockchain. It’s massive because it contains a record of all bitcoin transactions that have ever taken place since Bitcoin was first released in 2009. When you send a payment, your wallet or app sends out a request to the entire Bitcoin network which is made up of computers or nodes. These nodes then validate your transaction using known algorithms. 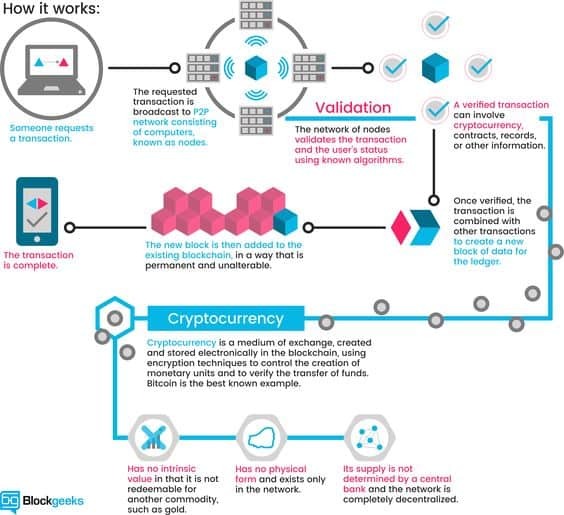 Once your transaction is verified and confirmed, it is then combined with other transactions to create a new block of data for the blockchain. This new block is then added to the end of the blockchain. When this happens, the transaction becomes complete and is now permanent. The answer is the miners. The miners are literally the lifeblood of the entire bitcoin network. Some have even compared miners to being hamsters in the wheel that keep the entire Bitcoin network going! And this is true. Miners play such a huge role in the success of Bitcoin that they truly deserve getting rewarded in precious bitcoins. Without them, no new blocks would be created and added to the blockchain. If nothing is added to the blockchain, no transactions are ever finalized. This means no bitcoins payments are sent and received by anyone on the network. No new bitcoins will be created. Because miners are indispensable to the Bitcoin network, they are compensated for their hard work in terms of bitcoins (it would not make any sense to reward them in traditional paper currency). They are almost like employees of the network. Since there are only a limited number of bitcoins (21 million), the number of bitcoins that miners are paid with will continue to dwindle until all bitcoins are exhausted by around 2140.